This page is about the the medium tank Centurion Mk 10. For other uses, see Centurion (Disambiguation). The Centurion Mk 10 is a Rank V British medium tank with a battle rating of 7.0 (AB/RB/SB). 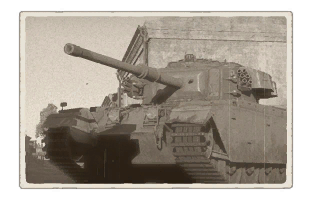 It was released along with the entire British tree line in Update 1.55 "Royal Armour". An upgrade over the previous Centurion Mk 3, the Mk.10 boasts slightly better frontal armour and a more powerful 105 mm L7A1 gun, but remains a vulnerable target in the Rank V battles. The steel boxes around the turret give 4 mm while hull steel boxes give 6 mm of additional protection, though these seem to be a negligible addition. Spaced armour plates are placed on the side of the Centurion, giving an additional 6 mm of side armour. Ammo racks of the Centurion Mk 10. The Centurion Mk 10 should provide a comforting learning curve to those players who have inevitably enjoyed playing with the previous Centurion tanks in the British tree. It may also be your first introduction to the 105mm Royal Ordnance L7A1 cannon which is an undeniably fantastic cannon with high penetration and precision at long range, able to load APDS and HESH. This gun is capable of penetrating the front glacis of a Tiger II at long range. Players will also appreciate the updated armour on both the frontal hull and turret. The tank also retains its great mobility, but still suffers from having a slow top speed. These traits make the Centurion Mk 10 an excellent sniper and fire support vehicle, being able to hold back and pick off enemy vehicles at range. Playing the Centurion too aggressively may result in the you being quickly outmanoeuvred early game, particularly with the introduction of Italian vehicles, in particular the high ranked armoured cars such as the AUBL/74 and the highly mobile German tanks like the Leopard I and Ru 251. The Centurion rewards a player who has patience and good awareness of their surroundings. 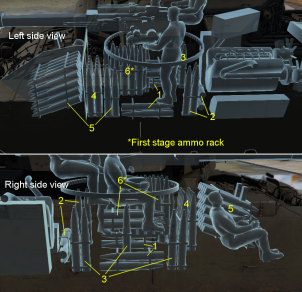 As per usual,"Parts" and "FPE" should be the focus first for modifications to increase combat survivability. Everything else is fair game after you get those two. Lower glacis is still a prominent weak spot. The tank's concept was made in 1943 when the Directorate of Tank Design, under Sir Claude Gibb, was asked to produce a new heavy cruiser tank for the General Staff under the designation A41, which was to become the standard of a British "Universal Tank" to replace the separated "infantry" and "cruiser" tanks currently used. As World War II progressed and the Germans unveiled their heavier tanks with an 88 mm cannon like the Tiger, War Office made a revision to their design requirements to counter this threat. The requirements now include an increased durability and reliability, with the ability to protect itself against the 88 mm gun and mines, an agility similar to the Comet tank, and a good reverse speed, all while staying under a 40 ton weight. Responding to these requirements, the department developed a larger hulls by adapting the suspension on the Comet, lengthening with another road wheel and spacing between the wheels. The standard Christie suspension used on the previous cruiser tanks was replaced by the Horstmann suspension, which uses coil springs on two-wheel bogies on each side and is easier to maintain than the Christie suspension. The hull used a welded, sloped armour with a cast turret mounting the famous 17-pounder cannon. The speed of the tank would be established by using the Rolls Meteor engine previously used on the Comet and Cromwell. Despite these changes, the department concluded that the weight restriction would not allow the tank design to withstand the 88 mm rounds. The weight restriction was done so the tank would be able to be carried around in the Mk.I and Mk.II transport trailers, which had a 40-ton load. This restriction was rescinded to allow more freedom in the tank design, which showed potential to War Ministry. The heavier tank designs developed had armour equivalent to the heaviest infantry tanks like the Churchill tank, yet with superior cross-country mobility due to improved suspension and engines. The tank was given the name Centurion and the first mock-ups of the design was made by AEC and was presented in May 1944. After that, 20 pilot models were ordered with a various armament combinations. Ten had a 17-pounder and a 20 mm Polsten gun (5 with a machine gun in turret rear, 5 with an escape door instead), five had a 17-pounder and a BESA machine gun and an escape door, five more with the 77 mm HV gun with a driver operated hull machine gun. The prototypes of the 40-ton design, the Centurion Mk 1, had a 76 mm armour on the front glacis, which was made very powerful with the heavy sloping design on the tank. 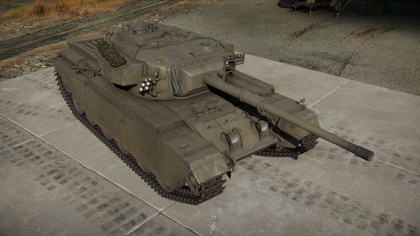 Added with a 152 mm thick turret armour, the Centurion became a very protected tank design, yet it was also very agile, outperforming the Comet tank in tests. The next Centurion model, Mk.2, featured a much thicker 118 mm front glacis armour and a thicker side armour. Production began for the Centurion Mk.2 in November 1945 for 800 tanks from Leyland Motors, Royal Ordnance Factories, and Vickers. The Mk.2 was put into service in the 5th Royal Tank Regiment in December 1946. After the Centurion Mk.2 was put into service, Royal Ordnance developed the successor to the 17-pounder, the 84 mm 20-pounder. With this, the Centurion went through another upgrade to mount the 20-pounder. The 20 mm Polsten gun was removed and replaced by a BESA gun due to its questionable utility. The new upgrade, now the Centurion Mk 3, also featured an automatic stabilization system that improved firing accuracy while on the move. The tank was first produced in 1948 and overtook the previous Mk.1 and Mk.2 in service. However, the 20-pounder also did not stay in service for long and were replaced by the more powerful 105 mm L7 gun from Royal Ordnance Factories. All Centurions versions after Mark 5/2 used the L7 gun, including the Centurion Mk 10, which also featured additional armour with the new gun. The Centurion first saw combat in the Korean war in 1950 in the British 8th King's Royal Irish Hussars. The Centurion Mk.3 issued to them had to be cared for in the winter conditions of Korea. Steps such as parking the tank on straw, starting the engine every half-hour, and keeping the gear engaged has to be done to keep the tank from becoming frozen in place. The Centurions made a great impact in the battlefield, covering the withdrawl of the 29th Brigade. In 1953, the Centurion saw part in the battle of the Hook in the 1st Royal Tank Regiment, repelling the swarming Chinese infantry. General John O'Daniel from the US 1st Corps praised the Centurion's mobility throughout the mountain terrains. After the Korean War, the Centurions saw service again during the Vietnam War in the Royal Australian Armoured Corps after complaints were made on the thin armour of their armoured vehicles. The Centurions landed on 28 February 1968. Headed by Colonel Donald Dunstan, he ordered the Centurions to reinforce firebases at Coral and Balmoral. The use of the Centurions by the 1st Australian Task Force helped them in the Battle of Coral-Balmoral that caused massive casualties in two infantry regiments among the enemy with no known tank losses. After the battle, more Centurions landed into Vietnam, with a total of 58 Centurions in the country at once in the span of three and a half years. In this time period, 42 suffered damages, two were written off, and two crewmen were killed in action. The Centurions also made up the bulk of India's tank forces, to which they used against Pakistan in the conflicts that occur in 1965 and 1971. In the middle east, the Centurions were supplied to Israel and Jordan in the 1950s. At the time of the Six-Day war, Israel had 293 Centurion tanks and Jordan had 90 Centurions. Both countries used the Centurions against each other in the war. Sometime in early 1970s, the Centurions on both side were upgraded with the 105 mm L7 gun. Both Jordan and Israel used the Centurion again in the 1973 Yom Kippur War, where the Israel establish the Centurion's prowess in battle during the Battle of Golan Heights, where 100 or so Centurions are able to beat back 500 or more Syrian T-55 and T-62 tanks. While the Centurion still see use in Jordan today, the Centurions in Israel were retired in the 1990s, only staying as armour personnel carriers and armour recovery vehicles. In the middle east, the British used the Centurions again during the 1991 Gulf War against Iraq, though only as an AVRE in the 32 Armoured Engineer Regiment. Three were lost in training incidents with no deaths among the crew. Sweden and South Africa also used the Centurions, buying them from Britain after World War II. The Centurions in South Africa were retained and upgraded due to their superiority over anything their neighbors had at the time, with a focus on the upgrade to the 105 mm gun and belly armour to protect itself against mines. Sweden bought the Centurions in an attempt to standardize their tank forces as it was the most cost-effective method, plus the Centurions have a huge upgrade potential to counter future threats. The British offered to sell the Centurion in late 1952, to which 80 were ordered by Sweden. The first deliveries were made in April 1953, followed by more orders and more deliveries until about 350 Centurion tanks ranging from Mk.3, Mk.5, and Mk.10 were in Sweden. The Swedish military used the Centurions until 1990s, modernizing the tanks with upgrades in equipment and internal mechanics. They replaced the Centurions with Leopard 2s. The Centurion was also well known for being used in a nuclear test in 1953. A Centurion Mk 3 built by Royal Ordnance Factory as number 39/190 is supplied to Australia in 1952 and kept under army registration number 169041. Placed less than 500 yards from a 9.1kt nuclear explosion, it withstood the explosive force of the explosion. The engine was still functional and the ammunition were intact. The only effect the explosion did onto the tank was move it back five feet, removing all antennas, sandblasting vision slots, incinerating the cloth mantlet cover, and blow off the armour side skirts. The tank was simply drive off-site after the test, but it is believed that if a crew was in the tank at the time of explosion, they would've been killed. The tank, nicknamed the Atomic Tank was then used in the Vietnam War after being restored for action. The Centurion was hit by a RPG round in May 1969 that injured the entire turret crew. While one crew member had to evacuate from his battle wounds, the rest stayed in the still battle-worthy tank. Today, the tank resides at the Robertson Barracks in Palmerston, Northern Territory. Centurion 169041 is distinguished from other nuclear-tested tanks by having a 23 year service after the nuclear test, with 15 months in a hostile environment. A Centurion Mk.13 makes its move in Virginia. This page was last edited on 18 March 2019, at 01:23.